This particular banner is huge, so no problems at all with the details. 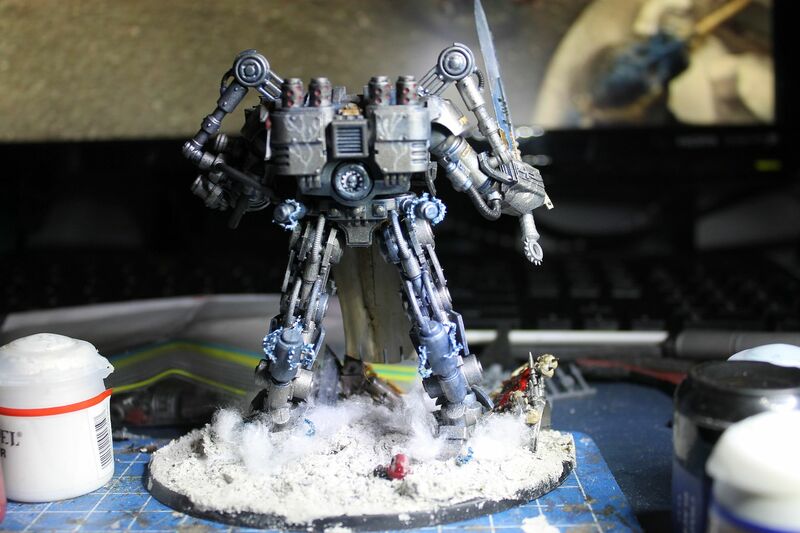 When you see the finished product, you'll see that it is actually taller than the dreadnought's body. In terms of painting it, it was great. The moulded details have enough shape to lend immediate form to the colour, drybrushing is still feasable, and there is still scope for blends... although it does get a bit tight around some of the backgrounds. If I were to do it again, I'd probably work from the lowest (deepest) details up to avoid rework or (horror) painting over some fine detail already painted. Very good! Everything's looking pretty awesome so far! Keep it up! Right. Got some painting done this weekend, it was good. First, put on the plastic screen for the dreadnought body and gave it a little 'fog'. Looking at it with the light, you can see the interior details still, which I was worried would be obscured. 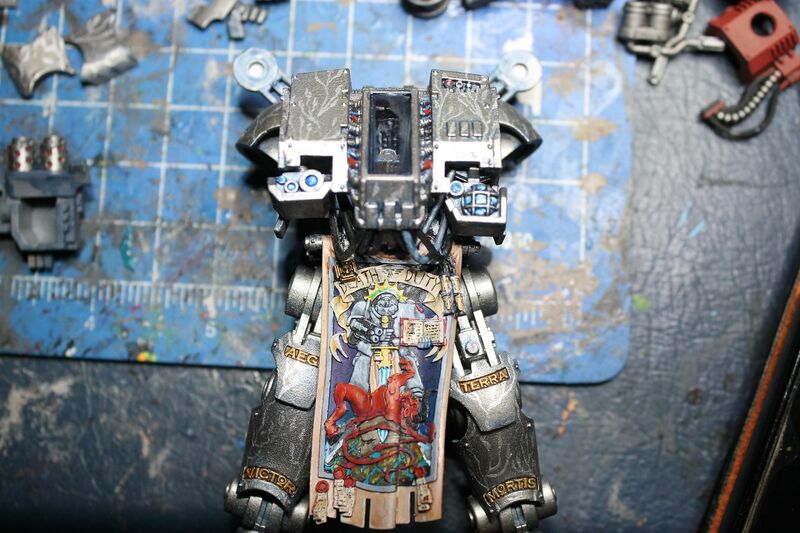 Detailing on the armour has gone pretty well too, I think. 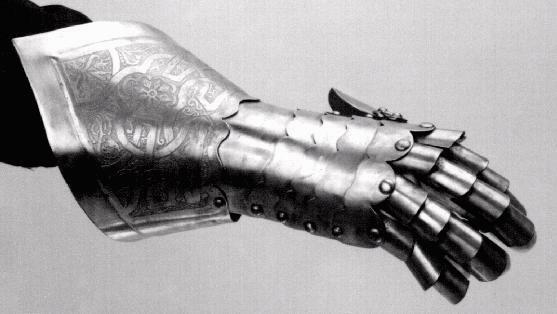 I decided to let the natural shine of the metalic paint do the work of highlighting for me on these pieces and let the patterning draw the eye. From there, painted the shoulder shield, blended the sword blade, blue tacked (damn friends borrowing my magnetising kit) the incinerator, finished the banner, painted electricity arcs, 'smoked' up some cotton wool and did some base details. Done. Last edited by Iraqiel; 11-25-13 at 11:33 AM. 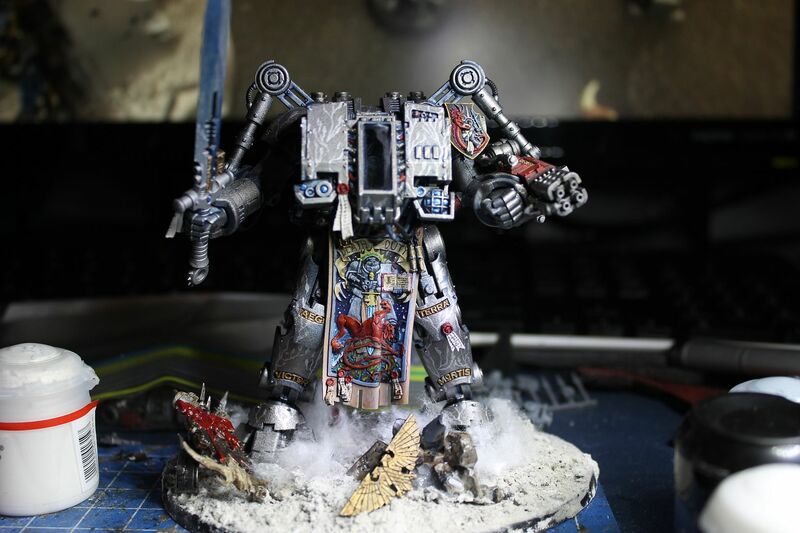 Fantastic model - i like the conversion, the banner and the smoke base is freaking epic! My only drawback would be the lightning - it's lacking in detail compared to the rest of the model. Maybe going over this in a light blue and highlighting it up to white would improve it? Thanks Ddraig, I have two on my dream list (though reading apocalypse, perhaps that should be three?) and I'm wondering what I'd do for a second... 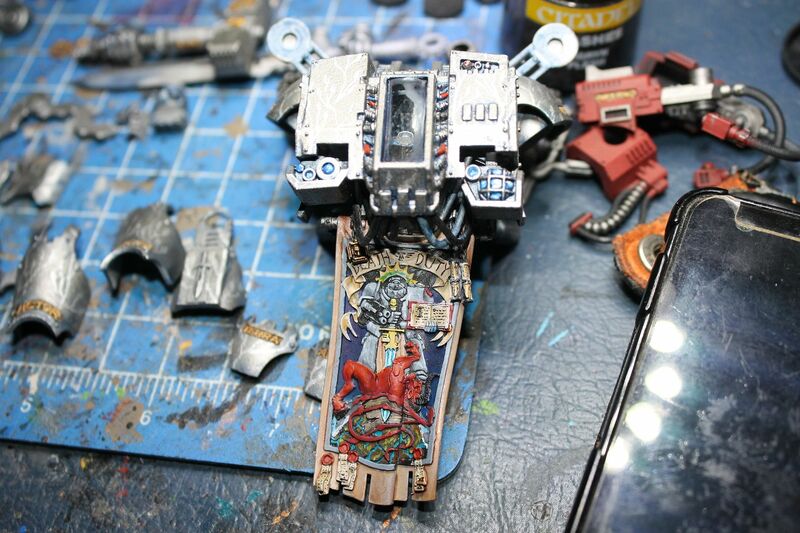 I'm thinking a 'ghost' powered one with a marine posed the same as the dreadknight ethereally floating before it. 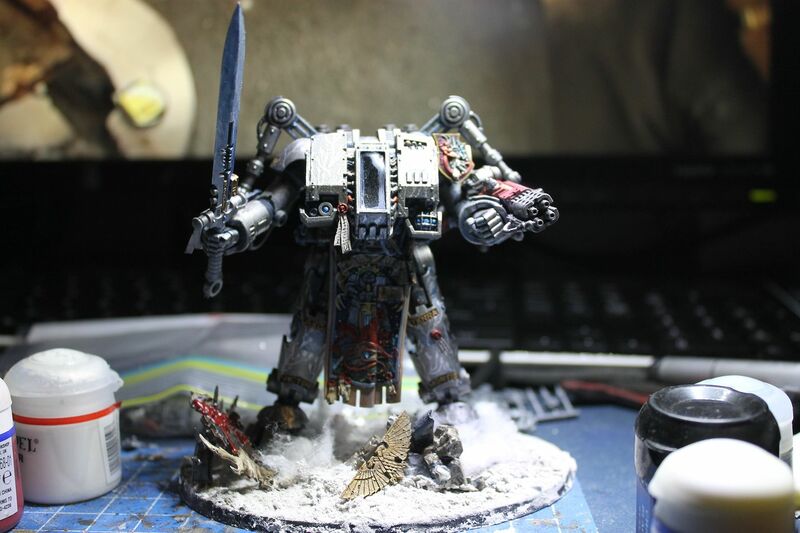 I'm thinking a 'ghost' powered one with a marine posed the same as the dreadknight ethereally floating before it.